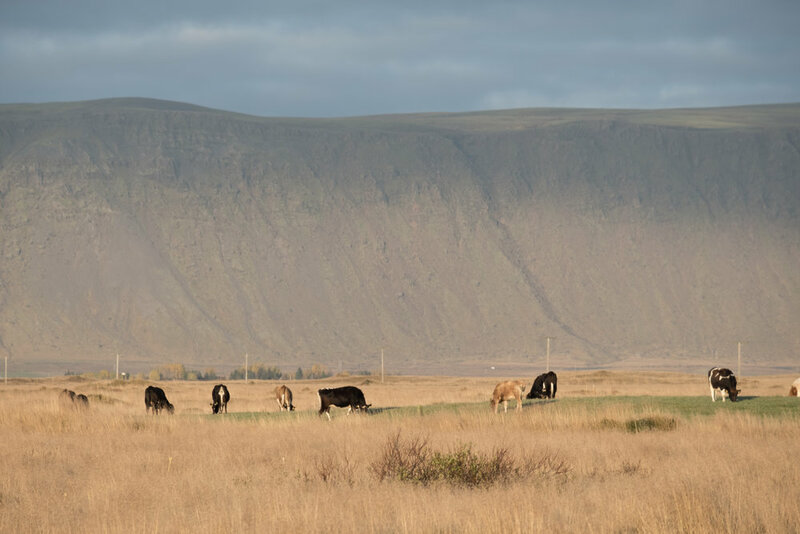 On the second day of our trip we woke up in Lambastadir Guesthouse in Selfoss. We enjoyed a breakfast with hot waffles and nice jams; and I'm pretty sure we also tried Skyr this day. This guesthouse was really a highlight of the trip, but the beautiful golden light rushed us out of the door. This stretch of the Ring road is spectacular. On the left side there was a mountain wall, maybe 50 meters tall; on the right side a plane or a beach separated us from the ocean. Every few minutes we would see another waterfall on the wall of stone - big and small, free-falling or touching the stone. Passing the creeks and the rivers made by the waterfalls on the one-lane bridges we would see many little rivers on black volcanic sand floating down into the ocean. Great rocks a size of a house on both sides of the road in between large open spaces where Icelandic horses casually wander around. The start of the mountain wall also hosts one famous waterfall - Seljalandsfoss - our first stop of the day. It's a single 60 meter drop can be walked around, thanks to a small cave behind it. The place is pretty popular with tourists, and we were happy to be there off-season and early in the morning. I was really happy that we came prepared - we've changed to our waterproof jackets on the parking lot. Half an hour later with my jeans completely covered in dirt and water and my camera out of three (!) batteries I realized that my preparations clearly weren't as good as I had hoped. Note to self: get waterproof hiking pants, get more batteries and maybe even a battery grip for the camera. Following the road, we quickly arrived to our next stop: Skógafoss. 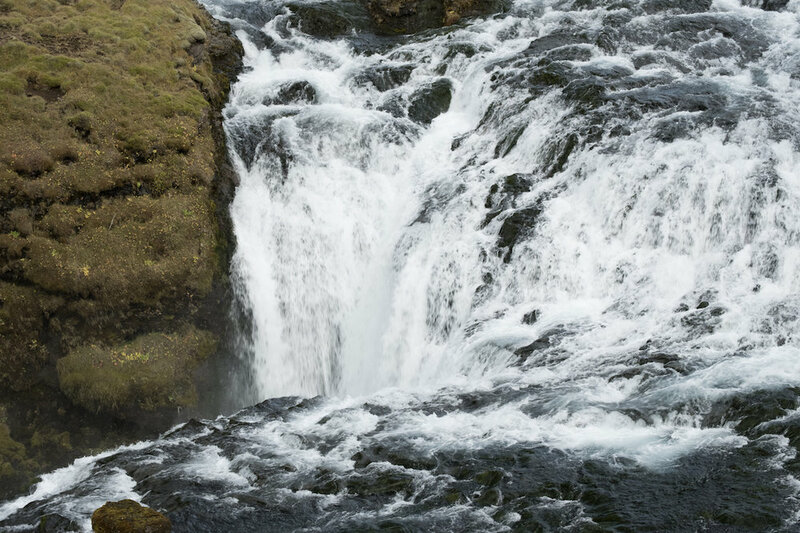 Another 60 meters tall waterfall; this one has a convenient staircase that you can take to get to the top of the hill and see the Skógá river cascading down through multiple small drops into the spectacular final fall, going through the plane and finally reaching the black sand beach. The bottom part and the first 100 meters past the staircase were a bit crowded, but if you follow the path further very soon you'll find yourself alone by the river. We really enjoyed this feeling of being alone in this crazy beautiful place, and I think I'll return to this memory for a long, long time. On the way down we went closer to the waterfall where I met a handful of fellow photographers who were clearly more prepared than I was - in wader boots, with raincovers for their cameras - they were standing there and waiting for something. At first I dismissed them as I thought they're doing long exposures, but very soon I learned what they were really waiting for. A beautiful golden light shined from the clouds and hit the mist from the falling water to create a beautiful, vivid rainbow. A feeling of childlike happiness overwhelmed me. This was a very special moment. The day was halfway over, but we managed to squeeze two more stops into it. 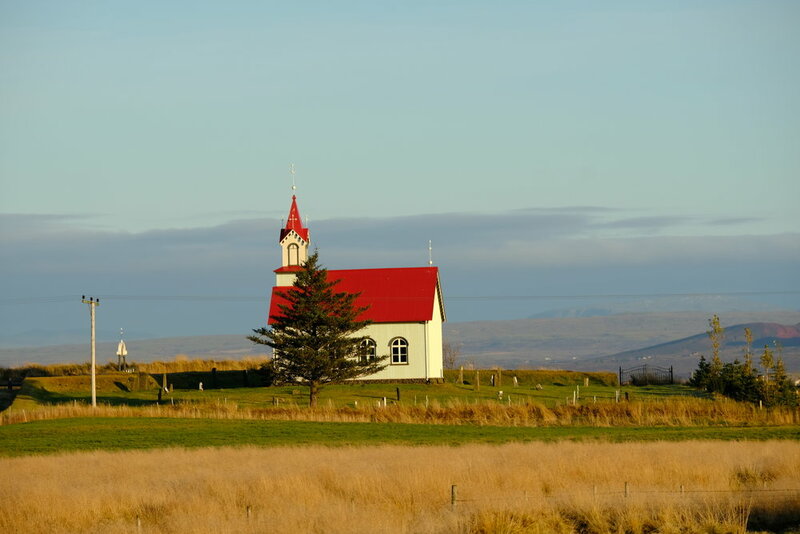 We quickly drove to Sólheimajökull, resisting the urge to stop and see stuff around - I hope one day to have a lot more time in Iceland to stop just as much as I'd want. A short and winding road brought us to the Sólheimajökull glacier where you can walk on a glacier with a guide. Since we were running a bit late, we only walked to the foot of the glacier to see the melting ice with the volcanic ash. I was amazed by the thin crust of ice on the edge of the lake formed by thawed water. The wind from the glacier is cold enough to make the water freeze! At this point the lunch was long overdue, but we haven't seen any restaurants on the way. We were happy to find a small cafe near the glacier where we ate a bunch of Icelandic lamb soup (really good, fat, meaty stuff; perfect after a walk in a freezing place like Sólheimajökull). From here we had two more things we hoped to do on that day - the WWII airplane on the beach and the black beach with the crazy volcanic columns. However we were running so late that it was clear that we'll have to choose one. We heard that the plane was not that special and that it wasn't worth the 30 minute walk (one way! ); but we figured we'll be able to go to the beach early in the morning. So the airplane it was. For reasons that we aren't sure of, part of the road to the airplane was closed for the cars. It used to be a minute's drive on a beach and a one minute walk from the parking lot; but now the parking lot has moved quite a bit further from the ocean (and the plane). This means that you have to walk this stretch. The walk was really weird - the road is absolutely straight, and all you see is rocks on the side of the road and the road cones. The sun was quickly setting, and we had to hurry up. After a brisk walk, we reached our destination, and obviously we walked on every part of the plane. Honestly, the plane wasn't worth the walk. But at least I can now be sure to skip it next time. The walk back to the car felt surreal. It was pretty dark now that the sun had set; we saw almost no people. Now were were walking on an endless dark plane, and in the far end of it we could see the lights of the passing cars with a glacier on a mountain. The objects were so distant that for the first 20 minutes they didn't appear to move toward us. It was as if there were no end to this road. My brain started to play tricks on me - with so little stimulation from the environment and such great fatigue, it was in a weird, sleep-like state. Why do I even take my phone on the walk with me? Is it really worth it?